If you’re feeling habitually tired and are wondering why, then, perhaps, you may have an iodine deficiency and be a candidate for nascent iodine. Since my mother was feeling unexplainably exhausted and never ate much salt, I suspected this may have been her problem even without any medical test. Though she is on the borderline for thyroid, this Nascent Iodine was still safe for her to take. Therefore, I thought she would be perfect to test LL’s Magnetic Clay’s Nascent Iodine for this review. Besides nourishing the thyroid gland and regulating metabolism, iodine acts to detoxify mercury, lead and cadmium in the body and helps the body excrete toxic fluoride and bromine. Without enough of iodine, your entire body can suffer. Your immune and hormonal systems as well as your energy levels can be affected. If you have a severe case of insufficient iodine, you can have anything from neurological complications, cretinism, endemic goitre development, hypothyroidism, decreased fertility to increased infant mortality. 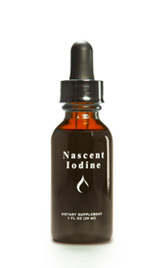 Nascent Iodine is consumable iodine that has once in water gets consumed in the “charged” state. What this means is that iodine delivered in this form is recognized by the body naturally as if it were produced as the same iodine from the thyroid. To use this product, my mother drank a glass of water with one drop of iodine twice a day on an empty stomach. One the first day, she did not notice a difference. The second day, she went to two drops for each dose and mentioned that she thought maybe this was helping her stay up longer when watching television. By the third day, she definitely felt perkier she assured me. Even the dark circles beneath her eyes looked lighter if you can understand that from my observation. To me, it just seems the longer she is taking this product, the better she is doing and looking. I honestly believe there’s lots of other people feeling exceptionally drained and searching for a solution like Nascent Iodine. I just know you could be helped and feel better like my mother, if this deficiency is truly the root of your suffering. Of course, check with your doctor before beginning to see if it will conflict with any of your medications. Another option is getting a medical test for the deficiency. I want to try the Prescript Assist Soil Based Probiotic.